Philly Cheese Steak Dip is the perfect hot appetizer twist to the classic Philly Cheese Steak sandwich. Easy, hot and delicious, Philly Cheese Steak Dip will be the favorite cheesy dip to serve up at your next social gathering! Philly Cheese Steak Dip … now say it again.. Philly Cheese Steak Dip … Mmmmm…. Now back to reality! Have you ever been to a party and looked around wondering where the food is at? I think we’ve all been to those parties. There is nothing wrong with a low-maintenance get together because honestly it’s supposed to be about being with friends and family but this girl needs food. What can I say? I’m a big believer that food is love and if I’m entertaining people, I am that person that has enough food to feed literally the entire neighborhood. And probably even the next one over too. It’s just my way to say I love you and thanks for being in my world. I think good food and great friends is the perfect combination (and an open bar!) and that pairing is what makes the world go round, my friends. 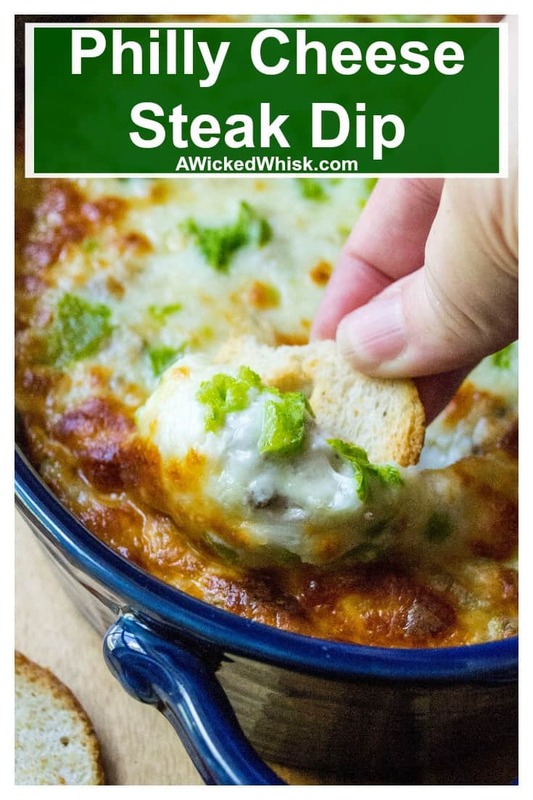 That ….. and this amazing hot cheesy appetizer known as Philly Cheese Steak Dip! So there’s this little thing starting up next week, maybe you’ve heard of it.. it’s called FOOTBALL SEASON!!!!! And I’m sorry but even if you are not a fan, chances are there is going to be a lot of friends and family joining together to celebrate the season. It’s honestly my favorite time of year and I have learned that it’s really hard to stay mad at somebody bashing your team when your dunking a tortilla chip into something hot and cheesy at the same time. Melted cheese squashes Rivalry Rage. I was looking for a new hot dip idea to serve people when they come over Saturdays to watch the games. I decided to take my favorite hot sandwich which is a Philly Cheese Steak Sandwich and make that into a delicious ooey gooey hot cheese dip. My brain about exploded the first time I tasted this Philly Cheese Steak Dip in real life vs. in my own brain. Talk about the perfect creation.. I think I could understand how Dr. Frankenstein felt the first time his monster came to life!!! Sorry.. totally off topic… I’ve been Halloween shopping … (sigh) … I’m sorry! Back to the deliciousness people!!! .. This is just your favorite cheese steak sandwich in an easy appetizer form and served on a chip! 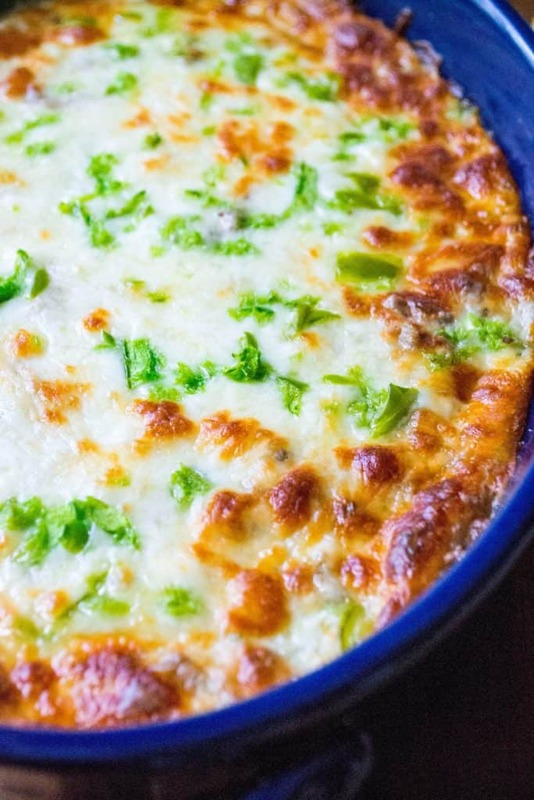 Super quick to pull together and made with ground beef, onions and green peppers, this Philly Cheese Steak Dip is now my new favorite cheese dip to cheer my team on with. 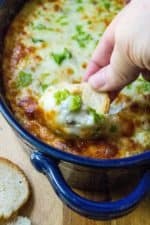 This Philly Cheese Steak Dip is perfect for sharing with friends and family or even if you just want to treat yourself. 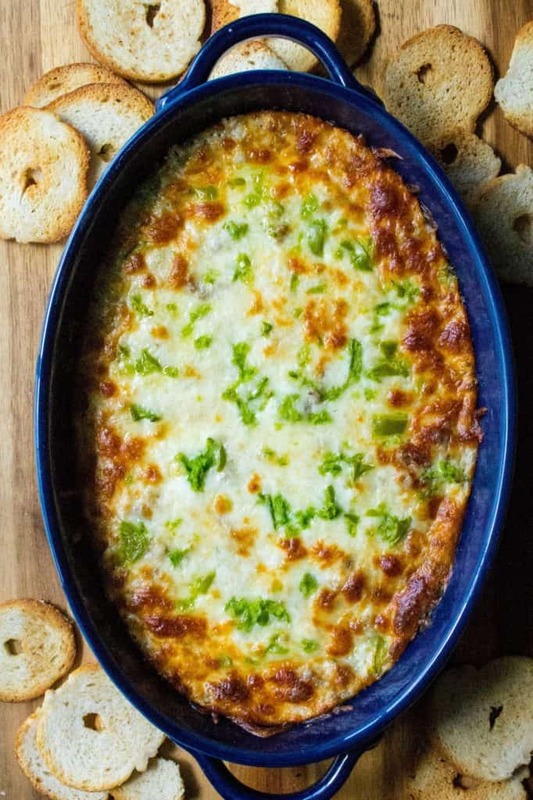 Philly Cheese Steak Dip is great for the holidays and perfect for any social gathering but in this particular instance, it’s all about the football games baby! Looking for more easy appetizer ideas? Check a few of my favorites below. Ps… Note to Self: Remember to get your nails done next time you have a post with bite close ups … sigh …. DID YOU LIKE THIS POST? BE SURE TO SHARE IT ON PINTEREST! In a large mixing bowl, add cream cheese, mayo, seasonings, Parmesan cheese and 2/3 of the American cheese. Add the meat, onions and green pepper mixture and using a hand mixer, mix until all is well combined. Spoon mixture into a baking dish and sprinkle with remaining American Cheese (and extra green peppers for garnish if you like) Bake 20 - 25 minutes or until top is golden brown. Remove from oven and serve hot with chips.